Couple of posts of mine just in case you guys think I don't think it has an affect. I always love talking about the Bay around this time of year and in winter especially if the pattern is ripe for Eastern U.S to feel the affects. January 3, 2012 talking about the Bay and being frozen over. because you are trying to justify a single source as the reason. It's not. No, where'd you get that idea from?! The question asked is: what effect the Hudson Bay has on the climate of North America. Not: is the single cause of anything. if that was the case then you would see it on a daily basis. That's why I post them. I wouldn't expect to see it every day. As you know very well, day to day weather is extremely variable. There are many patterns I wouldn't expect see on a daily basis. You can find many examples on days with completely different temperatures, air patterns setup. It's possible that the Hudson Bay makes Canada to the east somewhat colder on average than west of the bay. That does NOT mean, everyday east of the Hudson Bay is colder than west of the Hudson Bay. It is possible to have many days where east of Hudson Bay is warmer than west of Hudson Bay, as your example shows, even if on average the east side is colder. A one day picture is unhelpful at telling us what happens on average. The map I posted here of mean temperatures is more useful. Doesn't seem to show much effect IMO. Except climate is the average of years of daily data. You can pick any day out of say January and it is unlikely to similar to the average January climate. There are day to day weather fluctuations that get removed when averaged out. These day to day temperature fluctations are probably bigger than however cooling effect the Hudson Bay has, so without averaging they would be difficult to notice. A body of water (or mountains) could make one type of weather somewhat more likely and another less likely, but it would be hard to tell looking at day to day patterns. 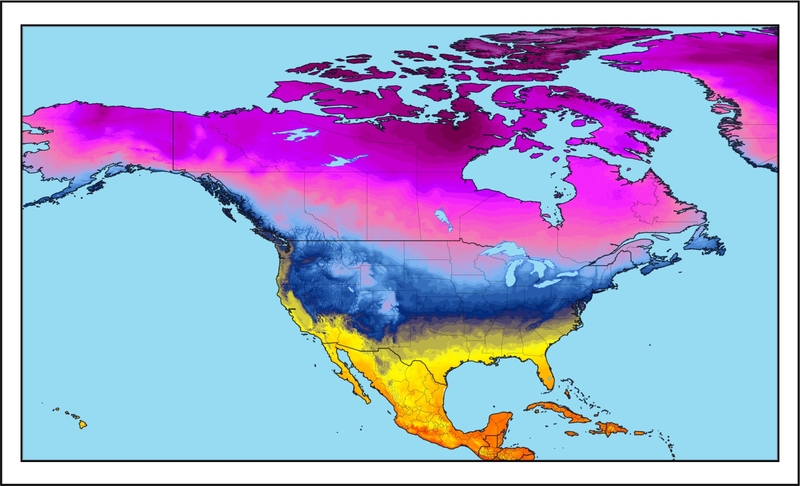 If there's a frozen body of water like the Hudson bay and the eastern side of it in Canada is warmer than the western side, what is that telling you? Some are curious what effect one single source has. I don't see what's so strange about that. My guess is that during the winter, the Hudson would act as insulation when compared to the western part of Canada. However, during the summer it would act as a cooler and would probably promote more troughing over eastern Canada and inevitably effect the eastern US. More importantly, the NAO is the dominant factor controlling climate variability over eastern Canada. Ask Tom Why: Does Hudson Bay have any effect on Chicago weather? Though Hudson Bay is more than 1,000 miles to our north, its icy waters do play a role in Chicago's weather. That region is a frequent host to large, stationary high pressure systems that keep a sustained northeast flow of air into the Midwest and Chicago. The air of arctic origin is not only cold, but also dry and can bring extended periods of cool and dry weather to Chicago during spring, summer and fall. When this type of flow occurs in winter, the result is often a prolonged period of cloudy, snowy weather. The snow is usually light due to lack of moisture except where the lake-effect from the Great Lakes enhances totals. When low pressure is parked over Hudson Bay in winter Chicago can be in line for major arctic outbreaks and sustained periods of severe cold. Just playing devils advocate and keeping the minds sharp. I love hearing and talking about how the Bay affects the "weather". Let's get that thing frozen and our "chances" increase for cold arctic air in the states. Climate and weather is a marriage of everything. And has anyone posted Canada's average seasonal temps? So, what would be the effect if Hudson Bay did not exist? Would there be stronger pressure systems more akin to the Siberian High? So if I'm reading your posts right, Hudson Bay's effects are more felt in the summer, where northeast Canada has cooler summers than anywhere else in its latitude? impressive map. Is it possible you could put a scale on it?